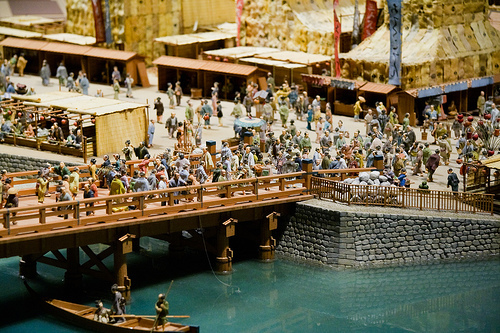 There have been new types of business in all ages, and [W:Edo period] (1603 to 1868) is no exception. The book “Ooedo Omoshiro Shobai” written by Hirotoshi Kitajima, introduces variety of unique business existed in Edo (present Tokyo) in Edo period. Simply to get rid of fleas off from cats. Luckily, we have trimmers now. They bought paper waste and made toilette paper and tissue. They bought candle drips from households and remade candles. Ash was pretty practical thing then. They used it as fertilizer, dish soap, ceramic glaze, and so on. Just like we have 100 yen shops now, they had 19 mon shops where all the items are 19 mon. The most successful business type in Edo period seems to be “recycling.” They didn’t waste anything and used everything till it got ash. Including the recycling business, we may able to get new idea and learn a lot of things from business in Edo.